Stretching from the Apennines to the Tyrrhenian Sea with its spectacular cities, scenery, and landscapes, Tuscany is one of Italy’s top vacation destinations. Tuscany is rich with artistic heritage, ancient hill towns, museums, churches, great wine and food, and beautiful countryside. Tuscany offers unrivaled pure nature, crystal clear sea and rich sea floor. Once you arrive you will notice the magnificent sceneries, the breathtaking Gulf of Baratti, the sites of Vulci, Pitigliano, and Vetulonia necropolis guards. Castles, medieval abbeys, villages, and beautiful towns are scattered over the whole region. Tuscany is regarded as the birthplace of the Italian Renaissance and has been home to many figures in the history of art and science. This region is also well-known for producing wine, including Vino Nobile di Montepulciano, Chianti, and Morellino di Scansano. The main tourist destinations in Tuscany are Florence, Pisa, Grosseto, and the most visited destination Castiglione della Pescaia. Particularly popular spots are Siena, Lucca, the Chianti region, Versilia, and Val d’Orcia. 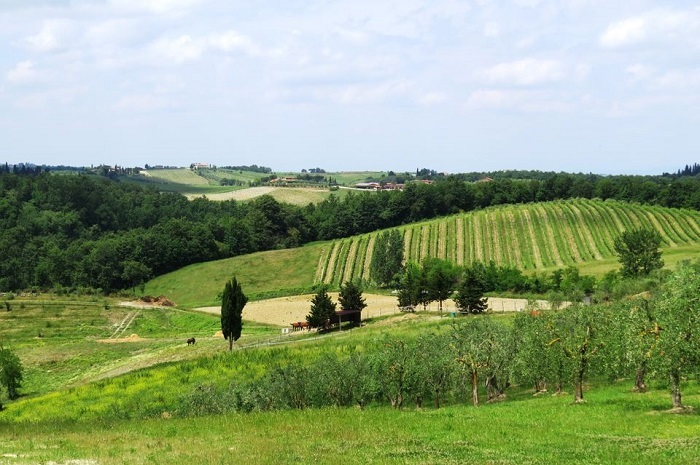 Tuscany has over 120 protected nature reserves and has seven localities that are designated World Heritage Sites such as the historical center of Siena, the Cathedral square of Pisa, the historic center of Florence and several others. Departing from Florence, your first stop will be the UNESCO World Heritage Site, San Gimignano. This splendid Italian medieval town is most famous for its Vernaccia di San Gimignano wine, saffron, and Santa fina pottery. Once you arrive don’t forget to enjoy its marvelous churches, magnificent towers, palaces and the best gelato in the world. You can wander around and explore the wonderful Piazza della Cisterna known for the ancient architecture. Afterwards, you will discover the unique Chianti countryside, where you can taste some Italian lunch and have a glass of local wine. You can use your free time to explore the monumental chapel, churches and the fascinating panoramic terrace of the villa. Sitting on the wine barrels you will taste the best of Chianti countryside, homemade local wine called Chianti Clasico and enjoy in the typical Tuscan lunch including cheeses, local pastries, pasta, and some meat. While you are there take a walk in the lovely colored garden of the villa and smell a different kind of flowers and luxurious plants. 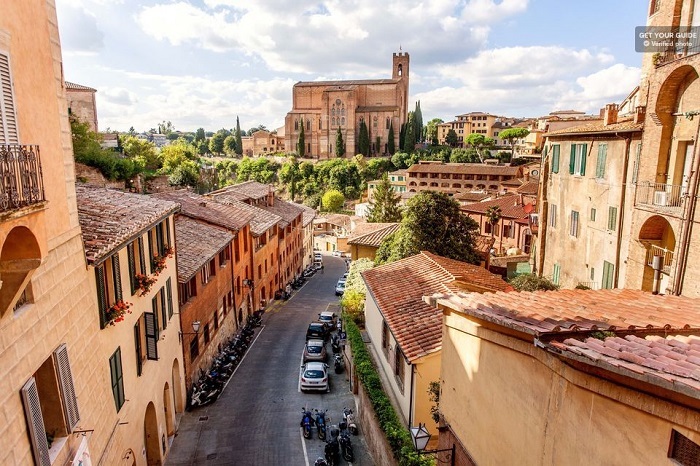 Later on, the trip will continue to the exquisite Siena, where your expert guide will introduce you to the history, traditions and culture of this stunning city. 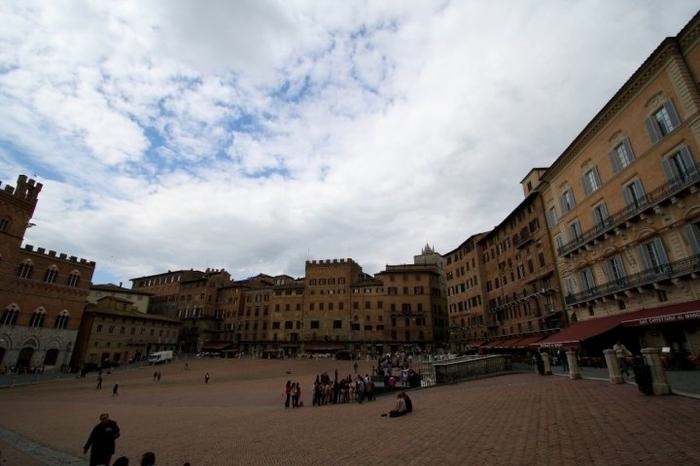 You will learn more about the Cathedral, Palazzo Comunale and the enchanting Piazza del Campo. Later in the afternoon you will hop a bus back to Florence. A landscape dotted with villas, castles, parish churches and farmhouses, woods with olive groves and vineyards, and exquisite wine are the best characteristic of the marvelous Tuscan countryside. Stop in the Florentine area and hear more about the winemakers’ secrets and see the cellars. Then you can enjoy a glass of the most dessert wine, Chianti Clasicco, Chianti Reserve and taste some snacks. Afterwards, visit the village of Greve where you can explore the main square and the local shops. This is the birthplace of the navigator Giovanni da Verazzano and the place where the most popular wine fair is held every year. Your next stop is a distinguished Sienese area of Chianti Classico. You will have a wonderful guided tour of the cellars where you will be enthralled by four different wines and local products. The tour will finish on the picturesque hilltop village of Castellina. You will have a nice walk on the medieval street of Via delle Volte and enjoy the impeccable houses, squares, shops, and the historical center. This magical 12-hours tour will start in the world famous city of Pisa, home of the astonishing Piazza dei Miracoli, the Leaning Tower which is one of the seven Wonders of the World, the historical Baptistery, and the Cathedral. You will have a chance to taste local wines and try the Italian cuisine in the restaurants. Your next stop will be the splendid San Gimignano, the UNESCO World Heritage Site. You can discover the town center with its cobbled streets and squares and learn more about the historical towers. Piazza del Campo, Piazza del Duomo, the Cathedral with its Gothic architecture are just some of the landmarks that you will visit on your last stop in Siena. Your guide will introduce you the most important spots in the city as the palazzos, piazzas, and other masterpieces. 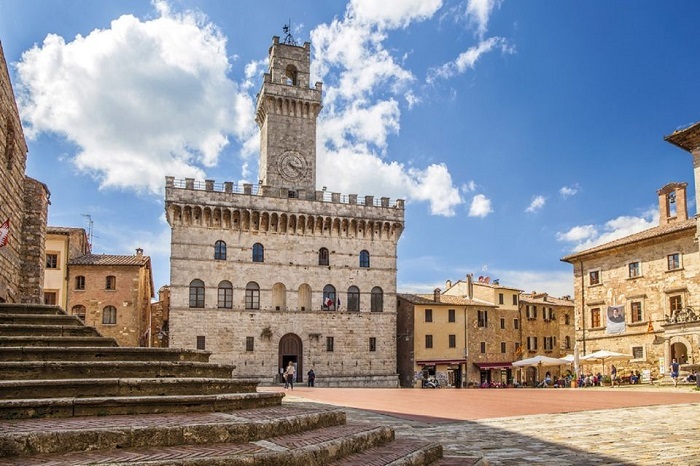 Declared a UNESCO World Heritage Site and famous for its skyscrapers, narrow streets, white wine, and the renowned Vernaccia wine, San Gimignano is your first stop in this one day tour of Tuscany. After spending some time in this medieval town, you will continue your trip to the wonderful Siena. Siena is a city of wonders, beauties, masterworks, and richness. Once you arrive enjoy the magic of Piazza del Campo, Piazza del Duomo with the imposing Cathedral and don’t forget to taste Tuscan products with traditional pastries in local restaurants. 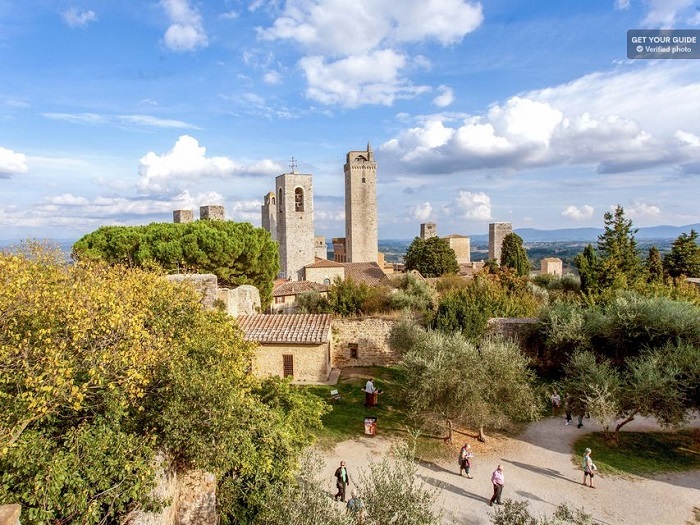 After lunch, visit the dazzling Monteriggioni where you will enjoy the Piazza Roma and learn about the history of the 14 towers called Medieval gem of Monteriggioni. The tour will conclude at a wine estate in the Chianti area where you can taste the Chianti red wine and enjoy a delicious homemade food. Celebrated wines, medieval villages and winelands this is what Tuscany will offer you on this full-day tour from Florence. The tour starts from the stunning Montalcino where you will taste a Brunello di Montalcino wine and snacks in the winery. You can also explore the charm of the village and the panoramic spots. You will continue to discover the Renaissance soul of Pienza and enjoy the town atmosphere and the jewel of the city, Val d’Orcia. While you are around taste the unique Italian pecorino cheese. The ancient churches, delicate vineyards, and Renaissance buildings are the symbol and treasure of the village of Montepulciano. You will spend some free time here to discover the beauty of the village and then you will take a coach back to Florence. Climb up the world-famous Leaning Tower of Pisa and enjoy the amazing panoramic view of the Piazza dei Miracoli. The tower has 300 stairs and is the third oldest structure in Piazza dei Miracoli. The tower was declared a UNESCO World Heritage Site. Chianti is the most famous wine region in Tuscany where you can taste different varieties of wine in the Chianti wineries. You can stop at the Florentine and Sienese area of the Chianti Classico where you will be welcomed by their winemaker. You can taste some different wines paired with local snacks. Montalcino is the birthplace of one the best wines in Italy, Brunello di Montalcino. Once you are there you can visit a cellar and sample some of its famous wines along with delicious local produce. Enjoy fantastic view of the Tuscan countryside, climbing the famous clock tower in San Gimignano. Located in Piazza del Duomo, the tower is 54 meters high and it’s the only one that is open to the public. One of the most fascinating places to explore is the UNESCO World Heritage Site of Val d’Orcia. It offers you a magical landscape and delicious wines. The area is also well-known for the production of extra virgin olive oil, saffron, truffles, and the famous pecorino cheese. Rich with frescoes, ornate interiors, and treasures, Siena’s gothic Cathedral is one of the most renowned places in Tuscany. Its most impressive and beautiful treasures are on the floor, where the pavement is decorated with mosaics. The biggest island of the Tuscan Archipelago and the third largest after Sardinia and Sicily is the Island of Elba. It is famous around the world for harboring French Emperor Napoleon in 1814 during his exile. But Elba is most famous for its clear blue sea and beautiful beaches. Quaint medieval villages, wonderful panoramas, and unique wine are just a few things you can explore in Montepulciano. It’s a home of the original Nobile wine and the best that Tuscany can offer you. Tuscany is full of outdoor hiking opportunities. The Apuan Alps, in both name and appearance, are so different from the rest of the Apennine mountain range that completely unveil their magnificence in the northern edge of Tuscany. This towering mountain has a huge variety of fauna and flora. Experience the magic of flight, a panoramic view of Tuscany’s vineyards, olive groves, and ancient townships. That’s the special emotion that you can feel from hot air balloon flying over the Florentine Chianti hills, Tuscany, Siena, Lucca and many more.